©Fondation Hirondelle / Fabian Jobin Caroline Vuillemin, Fondation Hirondelle's CEO, and Scott Weber, Interpeace's CEO, during the signing ceremony in Geneva, on May 4th, 2017. 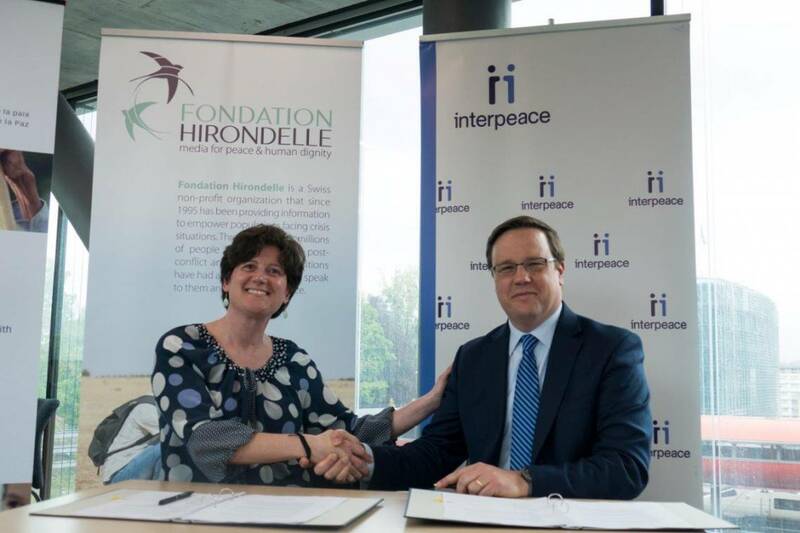 Fondation Hirondelle and Interpeace signed a partnership on Thursday, May 4th, 2017 at the "Maison de la paix" in Geneva, for new synergies between journalists, researchers and "peace builders" in contexts of crisis. "In conflict situations, access to information is a challenge," said Scott Weber, CEO of Interpeace. The media often lack credibility and sometimes aggravate the conflict. There are also practical problems of access to information for the population, as well as a need for dialogue between citizens and between citizens and the State. These challenges can be addressed through different angles. Interpeace does this by facilitating spaces for dialogue and sharing their results with policy makers as well as other parts of the population so that they too can contribute to these discussions. Fondation Hirondelle creates media spaces and helps journalists to apply the highest ethical and professional standards. " Interpeace is an international organization based in Geneva that works to consolidate peace in 22 conflict zones around the world. Interpeace and Fondation Hirondelle have been working together in Mali since 2013. The creation of Studio Tamani, Fondation Hirondelle's daily news radio program, was carried out in partnership with Interpeace, supported by the European Union. In Mali, Interpeace launched a participatory dialogue process for the population, with its local partner IMRAP. This process involved nearly 10,000 people across the country to create a "self-portrait" of Malian society and identify the causes of the conflict. This work, and its main lessons, were presented and discussed with all stakeholders, live, during special issues of Studio Tamani's "Grand Dialogue" debate programs, in Bamako and in the regions. This successful experience of working together in the field, at the service of an inclusive and large-scale dialogue for the people of the country, has led Interpeace and Fondation Hirondelle to develop their synergies in other contexts. This partnership demonstrates "our mutual interest in practical, local solutions and our common goal: to contribute to the construction of a lasting peace and more democratic societies", underlined Caroline Vuillemin, Fondation Hirondelle's CEO during her intervention. "We will also be able to draw lessons from our experiences together and put into practice among our organizations what we promote for the people we work for: being open minded, fostering dialogue and working together for better results" . Ambassador Valentin Zellweger, Ambassador and Permanent Representative of Switzerland to the United Nations Office and other international organizations in Geneva, participated in the ceremony. "Interpeace and Fondation Hirondelle are two strategic partners of the Swiss government," he said in his speech. "These two organizations share an approach that puts local actors and journalists at the forefront of peacebuilding. It helps build the groundwork for a local peace process. On behalf of the Swiss Government, I am very pleased to see these two organizations enter into a strategic partnership to address this critical challenge in fragile contexts. We are convinced that greater cooperation between organizations working in difficult contexts, based on their respective complementarity, may be a very impactful response to these multiple challenges. "